Hi!!! I know it’s been a while, but I’m back and definitely haven’t been lazing around. Since last post, I’ve visited two colleges, finished my internship at Sidechef 😦 and really got busy on those college apps. Well, with that said, it’s time to get back to Cultural Shanghai! This week, I finally get to visit that teahouse I’ve been talking about for the past three posts or so. Let’s have a cuppa tea! 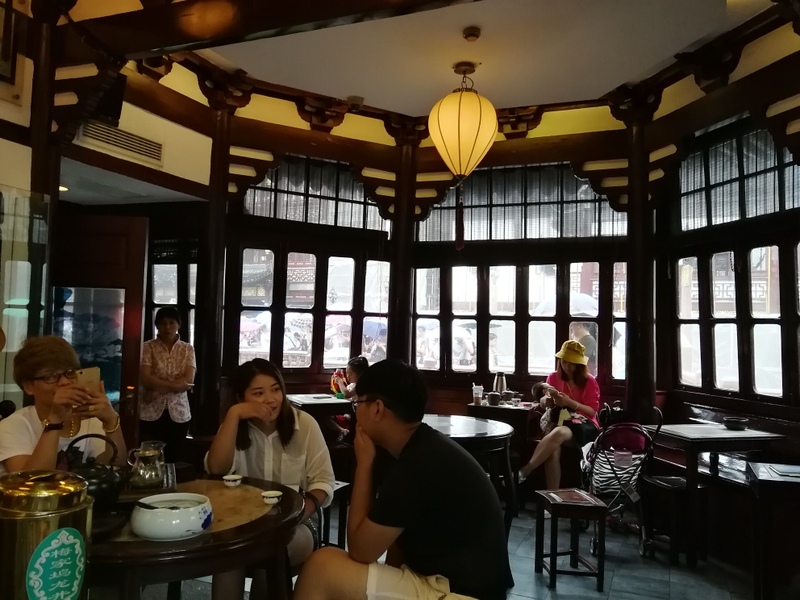 At 155 years old, Huxin Ting teahouse is said to be Shanghai’s oldest teahouse. Its name translates to Heart of the Lake Pavilion, so guess what it is…. that’s right, it’s a pavillion overlooking a lake. Which one? 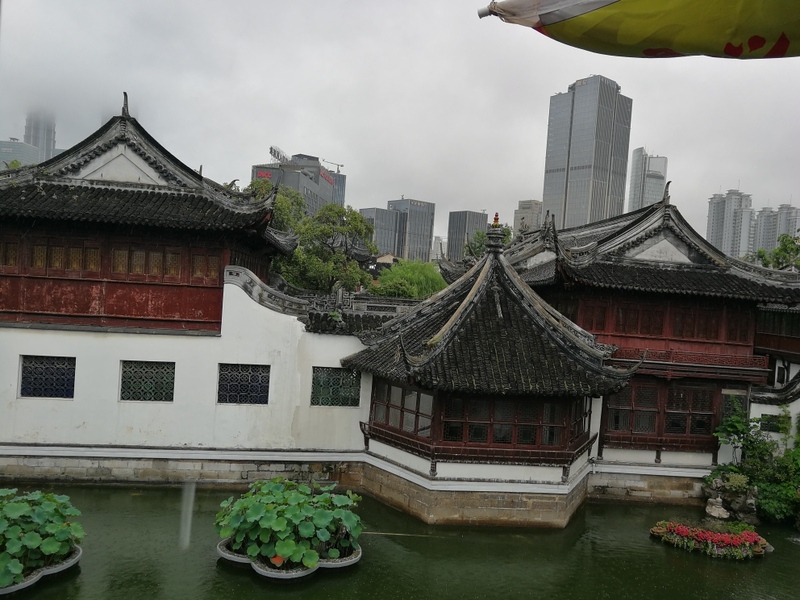 The beautiful lotus pond in the center of Yu Gardens, right next ot Lu Bo Lang. The building itself was built in 1784 by a cloth salesman as a place to chill. The pavilion started drawing quite a bit of attention, so his family put their business acumen to use and turned it into a successful teahouse in 1855. 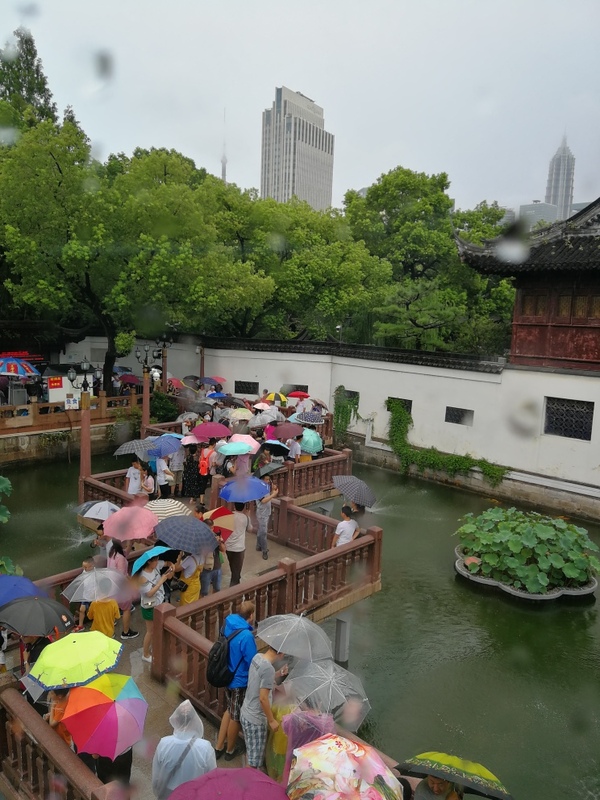 It got expanded in 1924, then, like the rest of the Yu Gardens, took a break for the Civil war, WWII and Communist takeover. 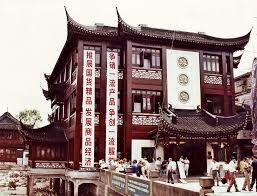 Finally in 1982, it reopened, this time with government protection. – Seriously, how beautiful is this! Seriously, the atmosphere is unbeatable. They really did an amazing job preserving the tradition. 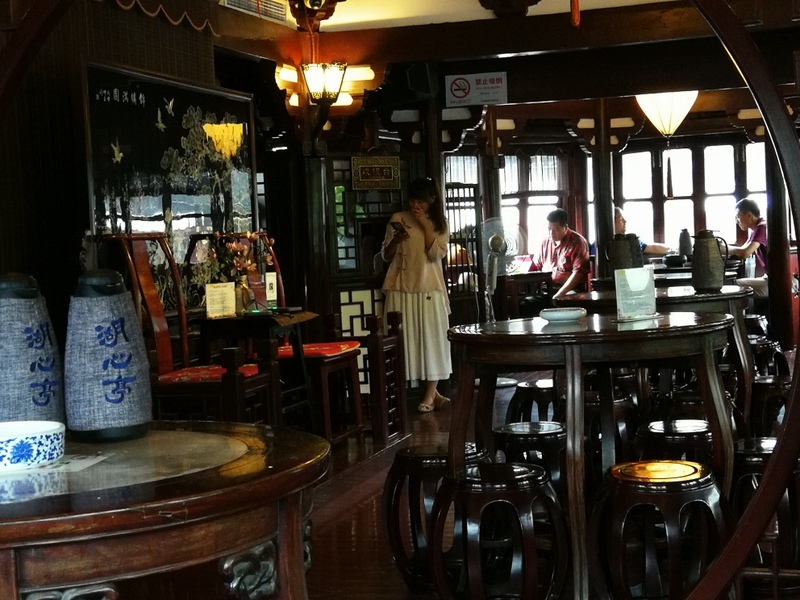 We felt transported back a century or two to an upscale, almost imperial, traditional Chinese teahouse. This teahouse isn’t just a beautiful place to sit and sip, it’s a royal favorite. Queens Victoria and Elizabeth visited, and are said to have loved it. Some notable visitors aren’t the only highlight. Hu Xin Ting offers many of the typical teas like chrysanthemum, Pu’er and Longjing, but it’s quality over quantity. They dry their own Longjing downstairs! 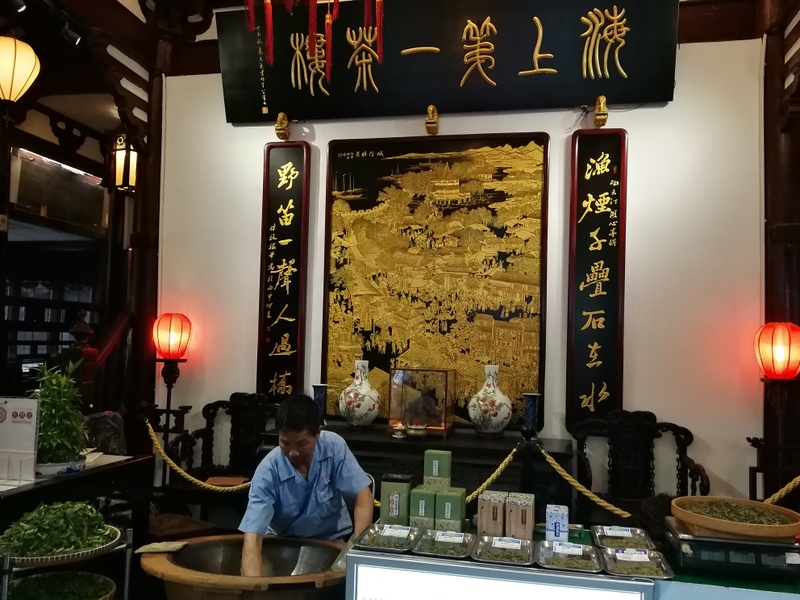 As much as we would have loved to sample every tea on the menu, we stuck with a Osmanthus Longjing and classic Pu’er. So did they meet the standard? Definitely. The Longjing had a distinct and refreshing osmanthus fragrance. I could definitely taste the freshness. The Pu’er, although not a specialty, was “ripe” and fragrant. These may not be the 3000+RMB teas at some specialty shop, but they’re definitely worth slow savoring. The only problem was that the leaves literally filled half the cup- WAY too strong, especially in the middle of the afternoon. 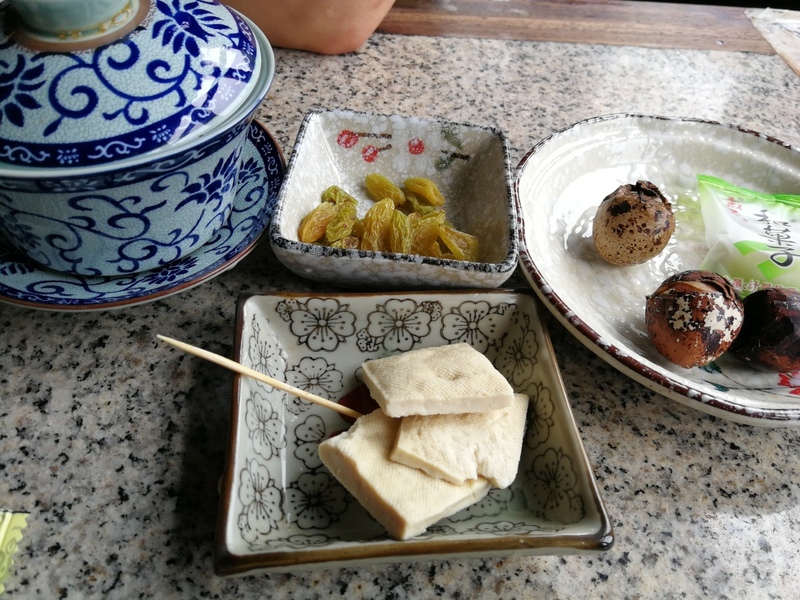 The raisins and mochi were prepackaged so nothing to say there, but the tea quail eggs and marinated tofu definitely hit the right notes. Both were flavorful and extremely cute! Well, that’s it for this week! Senior year starts tomorrow so be prepared for some regular college app complaints updates. Anyways, I hope everyone has a great week! Until next time, Bye! How beautiful it is to enjoy tea with my daughter in a later summer raining afternoon!